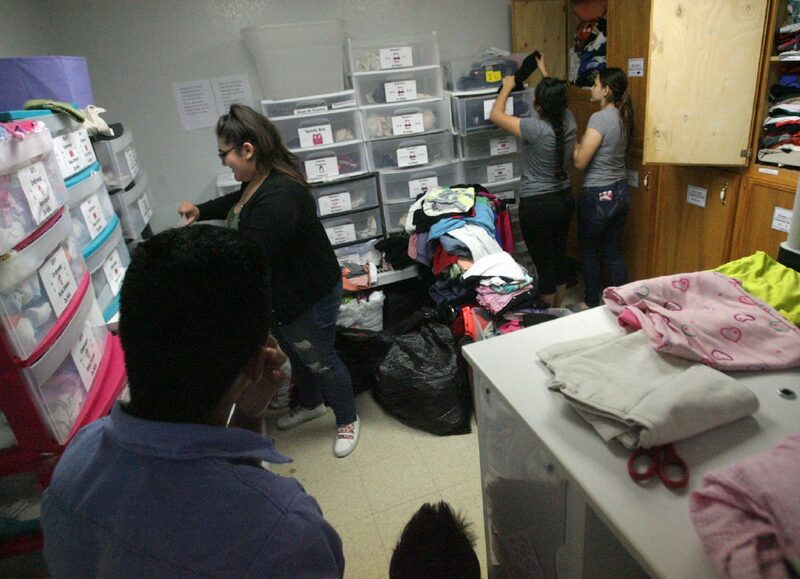 Volunteers at Humanitarian Respite Center help pass out clothes for needy undocumented immigrants Thursday April 12, 2018, in McAllen. The eighth annual Hope is in Bloom Gala will be held Saturday to raise funds for the Catholic Charities of the Rio Grande Valley, which hosts the gala. McALLEN — Catholic Charities of the Rio Grande Valley will be hosting the eighth annual Hope is in Bloom Gala on Saturday. The gala raises funds for the nonprofit organization, and since 2014, it’s been the main source of funds for the Humanitarian Respite Center. Since it opened, the center has served as a temporary home for immigrants making the journey to the United States. The gala usually brings in $100,000 to $125,000 every year through sponsorships and live and silent auctions. According to a news release issued by IBC Bank, Frontera Materials, a local construction aggregate, donated $5,000 for the gala. The money goes into basic needs for the center such as toiletries, food, utilities and rent for their downtown McAllen facility. Those are things that are “constantly needed,” Pimentel stressed. This year, they hope to raise enough funds to begin construction of their own facility. The new center will likely be several floors tall and is expected to cost upward of $6 million, Pimentel said. The event will take place at 6:30 p.m. Saturday, April 28 at the Embassy Suites hotel in McAllen, 800 Convention Center Blvd.